Okay, here is another one I’ve heard recently and has been reported to me by other church leaders trying to transition congregations into more intentional, discipleship oriented directions. 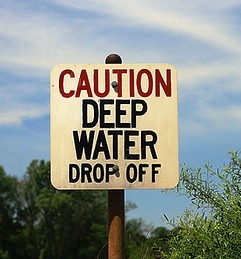 “When will we get into deep teaching?” Operative term here is “deep.” I’ve asked people what they mean by this, and pretty much across the board they mean ‘heavy duty Bible Study’; a sermon that just keeps digging away at the text and unpacks its meaning. I don’t disagree, there is something very deep about that, and being a bit of an insufferable academic myself, I can and do get into it. But to me the real meaning of deep isn’t only how far we get into the text, but how far we let the text get into us. If we keep learning and learning, but don’t spend time living out what we have learned, then ultimately that was all pretty shallow. I believe in digging into the message of Jesus, exploring how to apply it, practicing that, and then letting that whet our appetite for more learning – either because what we have tasted made us hungry for even more, or because trying to implement it into our lives made us realize how much more we need to know. One of the dangers of the church, and one of the reasons the church has lost relevance and value for younger generations, is that believing has been a head thing, not a life thing. Going to church or Bible studies are important, but it doesn’t make us look more like Christ or change the world. Last week was a – let us say, ‘significant’ – birthday for my wife, Kris. We always observe birthdays and anniversaries, but we don’t usually pull out too many stops for them. That fact made this birthday all the more tempting to do the ultimate… a surprise party… she’d never expect it. I’ll spare you the details, but even with some adverse last minute changes of events we were able to pull it off. And even though I had only gotten back in town the middle of the day before and had to pull the house and food together in very little time (thanks to great help from wonderful neighbor Lisa and all 4 kids doing great stuff) I have to say I really enjoyed it. In fact I enjoyed it so much it ‘surprised’ me. I love parties like this. I love to wander around and talk to my favorite people, scores of them, surrounded by good food and drink. But I enjoyed the party more than I that could account for, especially considering how hard I worked to make it happen. It took little reflection to figure out why. I was overjoyed (that sounds like a trite phrase, but it is what I felt) to do this for Kris. I learned a new aspect of my love for her that day. There is something deep inside me that found great satisfaction – almost fulfillment – in doing omething that she could enjoy so much, and that brought her the love of her family and friends that is so good and frue for her. Back to Isaiah 43.3b-4a (one of my favorite chapters in the Bible). This is my mom. She’s 87. She’s great. She’s the one who did all those mom things for me that you don’t really appreciate growing up because you don’t realize someone is doing them for you. After all you never experienced life without someone doing them for you. Now Mom is on her own. My dad died in June; he was 91 and they had been married 66 years and 7 days when he died. My mom also has a very poor memory. She doesn’t have Alzheimers and she can function just fine at the fantastic assisted living facility she is in. But she just can’t remember the simple things she just did. Like what she just had for lunch, or what she did yesterday. She can’t really read a book anymore because she has not only forgotten about the last chapter, she has forgotten she had started the book. When I visit her we have a great time. She knows who I am. She remembers my kids and where I live and that I’m starting this new church. She can do crossword puzzles faster than I can read the clues and she beats me in at least every other game of Scrabble. So why visit? I get no credit for it. It has no lasting impact. So what. She’s my mom. I want to see her. We have a great time. She may ask all the same questions every visit, several times every visit, but she cares about and understands everything I tell her. She gets another chance to love me, and I remember how much I love her. And maybe the brightness of that day makes the next one a little brighter for her, even though she doesn’t know why. But I know. It is the right thing to do. Life is about doing the right thing, because it is the right thing to do, not because of hope of reward or fear of punishment.